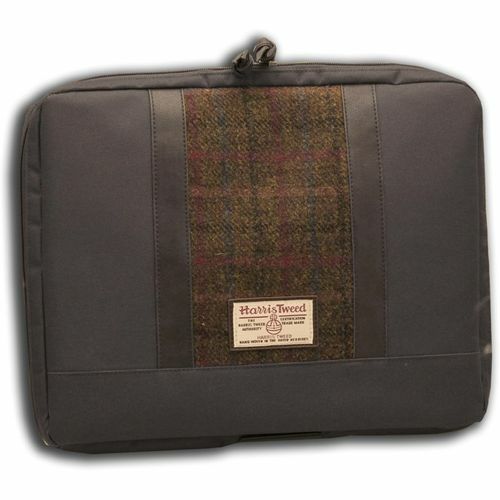 Treat yourself or a friend to a gorgeous iconic handmade Harris Tweed Laptop bag combining perfectly luxury and quality with traditional Scottish craftsmanship. This has to be the most stylish way to carry your laptop with you. Complete with chocolate brown hard wearing nylon body, two pu leather bands running down the front of the bag, also the Harris Tweed genuine label mounted onto a pu leather border sewn onto front of the bag makes this the ideal unisex gift. Secured by a zip fastening on top with a double pu leather pull. The fabric insert on the bag consists of a traditional check design including browns, greens, reds and blues and provides a classic British Look. Harris Tweed is about quality and style, history and heritage. It is the fabric of choice for many of the worlds leading designers. When you buy Harris Tweed you are guaranteed the best, safe in the knowledge that the Orb stamp secures a perfect cloth for years of use, this truly vintage textile has survived generations with its history stretching back to 1864. Harris Tweed is the only commercially-produced textile still to be handwoven and the only fabric protected by an act of parliament. Production of Harris Tweed is still true to its roots using weavers in the Outer Hebrides who take pure virgin wool and then dye and spin the fabric by hand.